TOWER SITE CALENDAR 2008 - COMING SOON!!! *So there we were on Friday night, wearing our "editor of 100000watts.com" hat, plugging in call letter updates, when we noticed a new callsign - WKEL, for EMF's new signal in Confluence, PENNSYLVANIA. That was all well and good - except for one question: what new signal in Confluence, PA? Actually, there was a second question, too: where the heck is Confluence, PA? And a third: how did a new signal in an obscure western Pennsylvania town slip right past us? In this particular case, it turns out that EMF filed the application way back in February, it was accepted in March, and was granted in late June. So where is Confluence, and why would EMF want to move an unbuilt station there from Meyersdale? It's a community of some 800 people, on the Youghiogheny River about 10 miles west of Meyersdale and 15 miles southeast of Uniontown - but the application calls for a transmitter site well to the northwest of Confluence, near Mill Run in Fayette County. At the same time, EMF eliminates a big overlap that would have existed between the Meyersdale signal and its existing WLKH (97.7 Somerset), which already serves Johnstown and a big swath of territory to the south. But in the process, it's playing an interesting game. In order to take part in the auction for the "Meyersdale" frequency, EMF had to apply for a commercial license; an application for a new noncommercial license can only take place during a filing window, and the next window, coming this fall, will cover only the "reserved" portion of the dial, from 88.1-91.9. EMF tells the FCC it pledges to follow all the commercial rules, including building a main studio to serve Confluence. However, it also acknowledges that it has the right, at some later point, to change the station's status to noncommercial - which it will have to do in order to follow the rest of its usual game plan, including filing for the main-studio waiver that will make WKEL a satellite of KLVR in California and daisy-chaining the noncommercial translators that will bring the signal into Pittsburgh. It's all strictly within the letter of the rules, as is everything that EMF does, but it seems - to us, anyway - to stretch the spirit of the rules more than a little bit. *Up in Montrose, between Scranton and Binghamton, WPEL may soon be abandoning the 1250 frequency that's been its home for 60 years. The southern gospel station (sister to the big-signal religious WPEL-FM on 96.5) has been granted a CP to move down the dial to 800, where it will still run 1000 watts by day, and will add night service with 135 watts, all non-directional. There's a new AM signal coming to the southeastern Pennsylvania airwaves, as Four Rivers Community Broadcasting's application for 1390 in Morrisville becomes one of 46 "singleton" applicants from the 2004 filing window to be cleared by the FCC to take the next step. That's the filing of a full Form 301 application, due by September 26. Four Rivers' initial application for the Bucks County signal asked for 250 watts, non-directional day and night from a tower on the north side of Levittown. *In upstate NEW YORK, all the numbers are in now on the big Clear Channel/Galaxy/Roser/EMF deal that's about to shake up the Utica radio dial, and it's clear that both Galaxy's Ed Levine and Ken Roser of Roser Communications come out as big winners. The big number first - Galaxy will pay Clear Channel $3.1 million for its nine-station cluster in Utica/Rome. But Levine won't need anywhere near that much cash by the time he's done spinning off five of the Clear Channel stations and one more from his existing cluster. EMF will pay Galaxy a total of $1,574,000 - $1,224,000 for Galaxy's big-signal WRCK (107.3 Utica) and another $350,000 for Clear Channel rimshot WOKR (93.5 Remsen). This piece of the deal also allows Galaxy to obtain an independent appraisal of those stations' fair-market value, and to take a charitable deduction on the difference between that value and the actual sale price. Roser, meanwhile, will pay just $650,000 for the "Kiss" combo (WSKS 97.9 Whitesboro/WSKU 105.5 Little Falls) along with WUTQ (1550 Utica) and WADR (1480 Remsen) - a remarkable price, considering Roser sold the two FMs and then-WLFH (1230 Little Falls) to Clear Channel for $2.15 million just five years ago. As for Galaxy, Levine ends up paying a net price of just $876,000 to add rocker WOUR (96.9 Utica), hot AC WUMX (102.5 Rome) and sports WIXT (1230 Little Falls)/WRNY (1350 Rome) to his cluster, plus whatever charitable deduction he can get from the EMF sale - plus the competitive edge he'll obtain from owning WOUR and eliminating its rock-format competition, WOKR and WRCK. It's no wonder, then, that Levine described the purchase to NERW as "the best deal I've ever done." Two New York broadcasters are moving ahead with their applications from the 2004 AM window: Bud Williamson's been cleared to file a Form 301 application for a construction permit for 1400 in Middletown (1 kW day and night), while Michael Celenza gets the go-ahead for a new signal on 1120 in Little Falls (1 kW non-directional days, 250 watts from two towers at night). *Multicultural Broadcasting's WNSW (1430 Newark) has signed off from its two-tower site next to the Garden State Parkway in Union, NEW JERSEY, and the station is now operating at reduced power from the WPAT (930 Paterson) site nine miles north in Clifton. WNSW (which changed format not long ago, from Korean to Spanish religion) holds a construction permit to go to 10 kW days, 7 kW nights, diplexing on all four of WPAT's towers, but Multicultural has to resolve the interference issue with co-owned WNYG (1440 Babylon NY) first; it's hoping the FCC will move quickly on its application to move WNYG out east to Medford, NY. BEAT THE PASSWORD RUSH! We've been holding out against the inevitable for many years now, but the time has come. After six years of giving away NorthEast Radio Watch for free, and six more years of asking for voluntary subscriptions from our loyal readers, we can no longer deny reality: if NERW is to continue on as the authoritative source of Northeast radio and TV news that it's become, the burden has to be shared across all our readers, not just those who pay for it voluntarily. So this fall, current issues of NERW and most of the NERW archives from 2003 onward will become password-protected for access by paid subscribers only. If you're already a NERW subscriber, nothing will change for you. Before the transition takes place, you'll receive a password and you'll continue to have full access to the site. If you're not already a NERW subscriber, now's the time to do something about it. By becoming a charter subscriber now, you'll get the benefit of our current low subscription rates, and you'll have no worries about waiting for a password when the changeover happens this fall. And did we mention that you'll be first in line for the Tower Site Calendar 2008, free to our premium subscribers? We've tried for many years to hold off this financial reality, but it's become hard to ignore. Not long ago, our pal Dave Hughes put part of his excellent DCRTV.com site behind a pay wall, and mandatory subscriptions are an established way of life at LARadio.com and reelradio.com, too, just to name a few. And even with a subscription model, we've just received word that the respected and venerable FMedia! newsletter has gone on what's likely a permanent hiatus. We have every intention of keeping NERW going strong as we head for our 15th anniversary in 2009, and for many years thereafter, and we're deeply grateful to the many readers who've already come forward with their support in recent years, as well as to the advertisers who've learned how advertising on NERW can reach one of the best audiences in broadcasting at a very economical rate. If you still haven't subscribed yet for 2007, do it right now at our Support page - and enjoy another exciting year of NERW, guilt-free. And if you have become one of our many subscribers, thank you! *Sinclair Broadcast Group is bowing out of TV ownership in MASSACHUSETTS, selling WGGB-TV (Channel 40) to John Gormally's Gormally Broadcasting for $21.2 million and restoring local ownership to the TV market for the first time since the 1983 sale of WWLP-TV (Channel 22). Gormally publishes the "Business West" business newspaper, and the ABC affiliate is his first television property. Springfield always seemed like something of an odd market for Sinclair, which entered with the $310 million purchase of Guy Gannett's six TV stations (including WGME-TV in Portland, Maine, as well) in 1998. While Sinclair has built duopolies, usually including Fox affiliates, in most of its markets, there simply weren't enough stations in the Springfield market to make a duopoly work. WGGB also retained a full local news operation while many of Sinclair's stations switched to the now-defunct "News Central" model. It remains far behind market giant WWLP in the ratings, and faces new competition from Meredith's CBS affiliate, WSHM-LP, so Gormally will have his work cut out for him. In TV news from Boston, Jen Street is departing WBZ-TV (Channel 4) after 17 years, the last two of them as news director. She's moving to the Massachusetts Eye & Ear Infirmary, where she'll be vice president for communications; no replacement has been named yet at WBZ. Meanwhile over at WHDH-TV (Channel 7), Kim Khazei is returning to the station where she anchored from 1993-2001. After taking a break to raise her children, Khazei's taking the anchor chair at 4 PM and 5:30 PM, as well as reporting for the 10 PM and 11 PM newscasts on WLVI (Channel 56) and WHDH-TV, respectively. It's taken more than a year, but the FCC has now signed off on the settlement deal between Living Proof, Inc. and two of its rival applicants for the use of 91.7 west of Boston - the University of Massachusetts Boston's WUMB and the channel's incumbent occupant, WAVM (91.7 Maynard). For many years now, we've been chronicling WAVM's fight to upgrade from its unprotected class D status to a protected class A signal, and we're sure there are a lot of relieved folks in Maynard now that the station is in possession of a construction permit that will take WAVM from 16 watts to 500 watts/77' DA. (Unlike an earlier WAVM CP for class A operation, which expired unbuilt some years back, we're pretty sure this one will be built, and quickly.) WUMB has its CP, too, for a share-time operation licensed to Stow but sharing the WAVM transmitter and antenna. And Living Proof now has its CP, for 572 watts/115' on 91.7 in Lunenburg, with a DA aimed mostly to the north. The only odd man out, as it were, is CSN International, whose application for 91.7 in Lexington has now been dismissed. The news isn't as good for Dennis Jackson's Radio Westfield, which has been trying to get the FCC to grant it a CP for a new 1340 signal in Westfield. The Commission has dismissed Radio Westfield's application, saying that it's impossible to put an interference-free signal over all of Westfield while avoiding interference with WWRV (1330 New York); Jackson had argued that the FCC should look at the "urbanized area" of Westfield, rather than the incorporated boundaries, but the Commission says that argument applies only to "townships" (what New Englanders would call "towns"), not to incorporated cities such as Westfield. And the rancor continues to grow over Howie Carr's attempt to bolt his longtime home at Entercom's WRKO (680 Boston) to become the new morning man at Greater Media's WTKK (96.9 Boston); last week's action included a countersuit from Entercom against Carr's lawsuit seeking to free himself from his WRKO contract. That brought a couple of revelations: paperwork accidentally left unsealed disclosed that Carr is paid just under $800,000 annually for his WRKO afternoon show, and we now know that Cary Pahigian is not only president and general manager of Carr affiliate WGAN (560) in Portland, Maine - but also Carr's agent. That's prompted some earnest hand-wringing about conflict of interest, but as long as WGAN owner Saga Communications knows about the arrangement, who are we to second-guess it? We jumped the gun a bit on this one a few issues ago, but now our ears on the South Shore have confirmed it: WGTX (102.3 Truro), the former WCDJ, is back on the air with oldies, as "The Cape's Oldies, Dunes 102." It's primarily an Outer Cape signal, and it's ID'ing with Provincetown at the top of each hour. Local band Grace Potter and the Nocturnals recorded new theme music for the show; check out a neat page on the VPR website with pictures of the recording session and audio of the new theme. And speaking of VPR, it has new calls for its classical outlet on 95.1 in Sunderland, with transmitter on Mount Equinox: the former WJAN becomes WVTQ. A well-known former Burlington morning host is looking to get back in the game. Louie Manno, who was paired with Jim Condon on Burlington stations WQCR and WKDR (and before that at the old WFAN in Connecticut) through much of the 80s and 90s, recently sold his "Radio Deli" after more than six years behind the counter. Now he's looking to return to the airwaves, either on the air or behind the scenes, and we wish him well! *A few new call letters in NEW HAMPSHIRE: WRNH is the new set of calls for Liveair Communications' 101.5 in Groveton, and Barry Lunderville's new 1450 in Lancaster grabs the WKDR calls that were over in Burlington, Vermont for so many years. *Here's more on last week's frequency and call change in eastern MAINE: When WREM (710 Monticello) moved to 780 and changed calls to WCXH, it changed formats and operators as well. Owner Allan Weiner is now LMA'ing the signal to Canxus Broadcasting, which is using it to simulcast AC "Channel X Radio," already heard in the region on WCXU (97.7 Caribou), WCXX (102.3 Madawaska), and the new WCXV (98.1 Van Buren). Canxus will reportedly LMA Weiner's new 94.7 FM signal in Monticello as well, once it signs on, and we'd expect "Channel X" to move there. Another new AM signal is headed for the Maine airwaves: the FCC says it'll grant Steven Wendell a CP for 650 in Raymond as part of that Auction 84 proceeding. The new signal north of Portland will have 250 watts day and night, aimed mostly east. In Bangor, AllAccess reports that Mike Carter has departed WHCF (88.5), where he was PD and morning man. He's returned home to Indiana, and it looks as though WHCF has yet to name a replacement. *And across the border in CANADA, Corus is moving forward with its AM-to-FM move at CHLN (550 Trois-Rivieres QC). The French-language talk station signed on its new FM signal at 106.9 last week, and it now has 90 days to sign off the AM dial. (Sister station CJRC 1150 in Ottawa/Gatineau is about to turn off its AM in favor of its new 104.7 FM signal, and CHLT 630 in Sherbrooke and CKRS 590 in Saguenay will be next to make the move. In Tillsonburg, CKOT (1510) is finally making its long-awaited move to FM. Its new FM simulcast, CJDL (107.3), signed on last Wednesday (Aug. 1) at 5 AM. The AM signal, Canada's last remaining daytimer, will continue on the air, and no changes are planned at CKOT-FM (101.3 Tillsonburg), which continues with its soft AC format. And Bob Dearborn, who made a name for himself at WCFL in Chicago and was most recently morning man at CHWO (AM740) in Toronto, has a new gig in Kitchener-Waterloo. Starting tomorrow, he'll be doing mornings at CKWR (98.5), reports Milkman UnLimited. An unusual weather system with winds that may have hit 120 miles per hour took down a radio tower in central MASSACHUSETTS last Wednesday. WESO (970 Southbridge) lost its 240-foot guyed tower in the town of Dudley when the "derecho" (a system of downburst clusters that are part of a heavy windstorm) ripped across southern New England. The National Weather Service says it was the first derecho in the region since 1995. On the South Shore, the weekend was devoted to a celebration of the upcoming centennial of Reginald Aubrey Fessenden's Christmas Eve 1906 broadcast from Brant Rock in Marshfield. Saturday's highlights included a live WATD (95.9 Marshfield) broadcast from the Daniel Webster Estate and Heritage Center, featuring New England broadcasters past and present, including WHDH's Fred B. Cole (now 91), station owners Barry Lunderville, Dennis Jackson and Marshall Sanft, and a telephone hookup with a parallel Fessenden celebration taking place in Scotland. A gala party Saturday night was highlighted by the presentation of the first "Reginald A. Fessenden Broadcasting Award" to WBZ's Gary LaPierre, and several tables full of his WBZ colleagues turned out to salute LaPierre for the honor. One more piece of big news came from Entercom's WAAF (107.3 Westborough), where afternoon jock Mistress Carrie has, through the miracle of Webcasting, become one of the most popular radio personalities among the U.S. troops in Iraq and Kuwait. In September, Carrie will travel to the Middle East to spend 12 days embedded with the Massachusetts Air National Guard there, broadcasting back to Boston several times daily via satellite phone. She's currently soliciting phone cards from listeners to take to the troops - along with loads of WAAF goodies. The big story in NEW YORK last week was Air America's announcement that it will change flagship stations at the end of August, when its current lease with Inner City Broadcasting's WLIB (1190) expires. Beginning September 1, most Air America programming will instead air on Access.1's WWRL (1600), displacing a daytime lineup there that currently includes leased-time health shows (10 AM-3 PM) and several syndicated talkers. WWRL's current morning show, featuring Sam Greenfield and Armstrong Williams, will remain in place, as will its weekend Caribbean music programming and, likely, its carriage of the late-night Alan Colmes show. In western PENNSYLVANIA, the format didn't change at Connoisseur Media's WUSE (93.9 Fairview), but just about everything else at the Erie-market country station did. As of last Monday, "US 93.9" has given way to "The Wolf," with new calls WTWF. The station's airstaff is expected to remain in place, though it's running jockless right now. The Energy has run out in CANADA's largest market. Corus is pulling the plug on the "Energy FM" dance-CHR format that's been running on CING (95.3 Hamilton) and replacing it with country music on the 100 kW signal that serves the entire Golden Horseshoe area from Toronto to Niagara Falls. Energy moved to 95.3 with high hopes a couple of years ago, after launching on the weaker 107.9 signal licensed to nearby Burlington. (That signal became home to classic rock "Y108" CJXY, which had occupied 95.3 as "Y95.") In the meantime, Energy had expanded to four other signals: CKGE 94.9 Oshawa, which has since returned to its old modern AC format; CHAY 93.1 Barrie and CFHK 103.1 St. Thomas-London. CHAY and CFHK will stay with the Energy format, as far as we know. Corus launched "Country 95" on the frequency last Friday (August 9), and the format is running jockless for the moment, with a full launch scheduled for next Monday (August 19). Energy's airstaff was largely shown the door, though we hear morning jock "Big D" is headed to sister station Y108. Heading across the border, we'll start our U.S. report in PENNSYLVANIA, where a long-dead call and format returned to life in Philadelphia last week. WSNI (104.5 Philadelphia) dropped the "Sunny" nickname and soft AC format in 1990 to go hot AC as WYXR "Star," then went modern AC in 1999 as "Alice" WLCE. "Alice" was replaced by a day of non-stop "Here Comes the Sun" last Friday, followed by the relaunch of the old soft AC format and "Sunny" nickname, followed a few days later by the WSNI calls. Sunny challenges market-leader WBEB (101.1 Philadelphia), one of the last individually-owned major market FM stations in the country; it promises to be a good fight. If that sounds familiar, it certainly should; under the calls WCTP, 94.3 did country as "Cat Country" from 1998 until 2000, when it became WBHD and began simulcasting WBHT. At the time, "Cat" was simulcast on WCTD (93.7 Dallas), which later became active rock WBSX. When the WBSX calls and format moved to the former WAOZ (97.9 Hazleton) in April and 93.7 changed calls to WCWQ, there was speculation that "Cat" would reappear there as well; for now, though, 93.7 is still simulcasting 97.9. We'll start this week up in VERMONT, where TV viewers are still awaiting the debut of Burlington's newest TV station. WFFF-TV (Channel 44) is now shooting for an August 31 start date, to coincide with the start of regular-season NFL football on Fox. Burlington is the largest TV market with no primary Fox affiliate; once WFFF starts up, Fox will have outlets in every top-100 TV market. On the radio side, Wilmington's WVAY (100.7) switched its simulcast from WKVT-FM (92.7 Brattleboro) to WHDQ (106.1 Claremont, N.H.) on August 1, after WKVT owner Richard Lightfoot's offer to buy WVAY expired. The Brattleboro Reformer reports the problem was WVAY's tower leases on Mt. Snow and Haystack Mountain. The leases from the state were non-transferable, and Lightfoot was unable to strike a deal to get the tower space. Further complicating matters was interference WVAY was allegedly causing to state police communications. Lightfoot offered to fix the problems, but he apparently wanted to reduce the purchase price by some $60,000 to cover the added costs. Now it's WHDQ owner Jeff Shapiro in the buyer's seat, offering a reported $180,000 for WVAY. In addition to WHDQ (plus its booster in Rutland and translators in Hanover and Keene), Shapiro owns WRSI Greenfield, Mass., WZSH/WSSH Bellows Falls-Marlboro, WTSV Claremont, and several Upper Valley stations. 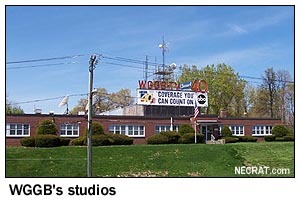 Moving south to MASSACHUSETTS, there's a new owner in the future for Worcester's WNEB (1230). Bob Bittner is selling the station to a group of local businessmen called "Heirwaves, Inc.," and word is that they'll try to run an all-local format on the station. WNEB has been rebroadcasting Bob's beautiful music from WJIB (740 Cambridge), with some separate leased-time programming on weekends. Further up the Worcester dial, we hear the mystery foreign-language pirate on 1620 has moved to 1610, while Spanish-language programming continues to be heard on 1680. Up in MAINE, Lewiston's Channel 35 made its debut on schedule last Friday, with general manager Doug Finck introducing the station, followed by an episode of "Star Trek: Voyager." The calls are now legally WPME(TV), having changed from WWLA. There's a new source for smooth jazz in upstate NEW YORK. Auburn's WPCX (106.9) shed its AAA format last Friday to become "Smooth Jazz CD 106.9." The station is aimed squarely at Syracuse, whose last smooth jazz entry, WXCD (now soft rock WLTI) was owned by Salt City Broadcasting, the same company that recently bought WPCX. (Salt City sold WLTI to Pilot last year.) "CD 106.9" is operating from studios on Burnet Street in downtown Syracuse, and it's planning to use the calls WHCD once the change is granted (until then, the WPCX ``legal'' ID is buried as early as :32 past the hour!). And down in Newburgh, WGNY is fighting to stay on 1200 kHz. The station is licensed as a daytimer on 1220, but since 1989 has held a construction permit to go fulltime on 1200. For most of that time, it has operated on 1200 under special temporary authority, while awaiting environmental approval to build the planned permanent 1200 site just south of Orange Lake. Now WGNY has been ordered back to 1220, but it has filed a petition for reconsideration in hopes of getting its construction permit for 1200 back. This should be a long, complex process that affects not only WGNY, but also WKOX Framingham, Mass. (which has had its hopes for more power repeately dashed by WGNY's existence co-channel on 1200), and even WLIB New York, which might be able to expand its pattern more on 1190 were WGNY to remain on 1220. *If you were waiting for Tower Site Calendar 2007 to go on clearance sale - sorry! As of June 1, the shipping department (which would be Mrs. Fybush, with an occasional assist from Ariel) informs us that the 2007 edition is now SOLD OUT. Many thanks to all of you who've supported the calendar over the past six years, and stay tuned for details on the even better Tower Site Calendar 2008, for which ordering will begin later this summer. (You can be first on the list for the new edition, which will be back from the printer in early August, by subscribing or renewing at the $60 professional level!) And in the meantime, visit the Fybush.com Store for information on remaining back issues of the Tower Site Calendar. NorthEast Radio Watch is made possible by the generous contributions of our regular readers. If you enjoy NERW, please click here to learn how you can help make continued publication possible. NERW is copyright 2007 by Scott Fybush.